No matter if you are startup company or a small to mid-scale one, sooner or later you will undoubtedly need a software to manage business relations with the old, existing and new clients. It is advisable to start at the beginning to avoid the hassles or data mix-up and errors when you realize that you now have truckload of data to manage and re-organize. The CRM (Customer Relationship Management) software helps you do that, and much more. Besides managing business relations and client data, the CRM software has other benefits such as optimize sharing of the information between employees and clients, managing contacts, improve efficiency in completing tasks at hand, security of data by providing access to only handful of people and most importantly analysing and constantly improvising on customer satisfaction. Realizing the significance of the following this model, quite a few companies began providing the Customer Relationship Management software early on. However, there are other companies as well who have developed their own CRM software’s. So below we have listed 21 such vendors, with a brief overview about it. The Companies listed below are random in order, irrespective of their rank, value or strength. Salesboom offers cloud-based CRM ‘s. There are 3 options to choose from; Team, Professional and Enterprise. The features include Tasks, event and document; Employee collaboration; case management; Inventory management and Mobile marketing automation among other features. Salesboom is one of the largest on demand CRM software providers. Although their software can be used in any kind of industry, they also have solutions tailored for a specific industry. Infusionsoft’s CRM software is mainly focussed on small businesses. They offer 4 options to buy from; Essentials, Deluxe Sales, Deluxe E-Commerce and Complete. The main features include Task, Contacts and Calendar management; Marketing automation, Sales automation and E-Commerce. You may watch the following video to know more about Infusionsoft. Salesforce is very well known for its CRM products. Infact, saying they are a market leader wouldn’t be a stretch. Salesforce’s different CRM products caters to different needs. The products include Sales Cloud, Service Cloud, ExactTarget Marketing Cloud, Salesforce1 Platform, Salesforce Chatter, Work.com and Salesforce Communities. Netsuite’s cloud based Netsuite CRM+ software delivers information in real-time. Its helps improve sales performance using features such as forecasting, upselling and commission management. It manages global sales and supports more than 170 different currencies and 15 languages. It also delivers quotes, order management and integrated Ecommerce capabilities. You may also watch its demo right here. Zoho Corporation, almost a decade old company now, provides solutions in Customer Relationship Management software, project management, office suite, note-taking, invoice, etc. Zoho CRM also has a free version available, for up to 3 users. With Zoho, you can also integrate with other third-party services such as Evernote and Mailchimp and sync with Google for email and Google Apps. If you are not sure whether you want or like their services, Zoho has Pay-as-you-go plan wherein there is no lock-in period. SugarCRM’s software is offered in 3 different editions; Suger Professional, Sugar Enterprise and Sugar Ultimate. Some of the features offered include Sales automation and forecasting, Marketing automation, Collaboration, Custom Activity Streams, Customer self-service portal, Private cloud and some more. SugarCRM offers Free Trial. If you are looking for a video as to how SugarCRM can help your business, here’s one. Microsoft Dynamics is Microsoft’s Customer Relationship Management software, offered in 4 editions; Workgroup Edition, Professional Edition, Enterprise Edition and Service Provider Edition. They have also now announced Microsoft Dynamics CRM Online. Oracle’s Customer Relationship Management software has lot of business specific editions for better experience. Some CRM products are Oracle Sales Cloud, Eloqua Marketing Cloud Service, RightNow CX Cloud Service, E-Business Suites CRM, PeopleSoft CRM, Siebel CRM and CRM on Demand. CRM on Demand is the SaaS based solution, while others are mostly On-Premise solutions where the organizations have control over its deployment and maintenance. 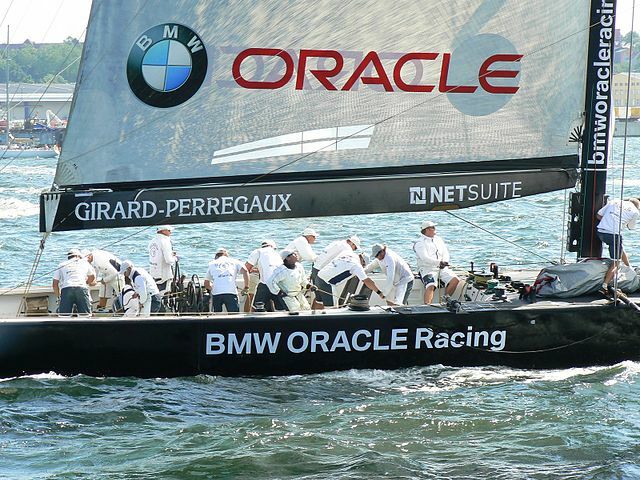 Oracle is also one of the largest ERP software suppliers in the world. Maximizer Software’s CRM product, Miximizer CRM is offered as cloud-based as well as on-premise. It provides various functionlities such as Sales Force automation, sales forecasting, Leads management and routing, Opportunity management, Sales action plan, Customer segmentation, Campaign ROI calculatorTask and document management, Crystal reports and many other features. Here’s a short video highlighting 12 key features in Maximizer CRM. Here’s one Customer Relationship Management software which is targeted towards small businesses. Act! offers 5 types of solutions; Pro, Premium, Hosted, E marketing and Mobility. It is primarily designed and for individuals and of teams of up to 10 people. You can add various apps on Act! from Act! Marketplace, including apps for a specific feature or function. In 2013, it was ranked 5th most popular CRM software in the US and 4th most popular in companies with less than 100 employees. bpm’online CRM offers a sleek, gorgeous looking and intuitive UI. Their software suite is offered in 3 different editions offered; a Team edition for small businesses, a bpm’online cloud based solution and an on-premise solution. In terms of features, bpm’online CRM offers Business Process Management for process modelling and execution, Customer data management, Lead management, Time management and communications, Enterprise social network, Knowledge network, etc. Nimble’s CRM features a clean UI with features such as a very detailed Contact Management; Activity Management to manage tasks, calendars and to-do lists; Social listening to monitor contacts on social networks; an Apps marketplace to use third-party integrations like Hootsuite, Aweber, Evernote, Google, Magento, Salesforce, etc. There is a free 14 day trial available, without any requirement of credit card information if you wish to try. SAP is a world leader in providing application for business, and obviously, cannot be left out of this list. Some of SAP’s Customer Relationship Management software products are SAP Sales, SAP Marketing and SAP Service, all being on-demand services. Already being a world leader in providing its ERP software applications for back office functions, businesses can take added advantage of even more functionalities when both the systems are integrated. LanternCRM is a relatively new company, founded only in 2012, offering its CRM software for small businesses. The Texas based company offers its CRM product in 3 tiers; Basic, Pro and Business. It offers features such as Google integration, Integration with more than 250+ cloud services, Tasks and contact management. They also have a Built-in Phone feature, wherein they provide the user with a Lantern Phone number which can be used through a browser or mobile/landline phone. It also has an ability to store voice-mails, record and log phone calls. A 30 days Free trial is available. Goldmine was one of the first companies to make Customer Relationship Management software for small and mid scale businesses. Goldmine offers 2 editions, a 3-user bundle and a 5-user bundle with features such as Reporting, Data synchronization, Sales, Scheduling and Contact management. Here’s a video about everything you need about Goldmine’s CRM software. Apptivo is one of the very few companies in this list to offer a free version, albeit with very limited features of-course. Besides the Free plan, there is a Premium and an Enterprise version to choose from. Apptivo’s CRM Apps Integrate with Project Management application for efficient project delivery, Human resources to manage contacts, Financials to manage revenues and expenses and invoices, Marketing to manage campaigns and targets. Founded in 2009, Apptivo claims to have more than 20,000 business customers. Commence is known for providing one of the most affordable Customer Relationship Management products. It is mainly focused on small and mid sized businesses. Key features include Contact Management, Google Apps and Outlook Integration, Project Management, Marketing Campaign Management and Lead Ranking & Scoring. Here’s a short video to know more about Commence CRM. Here’s another company besides Apptivo which offers a free version with limited set of features. There are 3 CRM products to choose from; Chaos Intellect, Time & Chaos and Chaos Free. Some of the normally found features include Contact and Task management, Emails, Cloud syncing and File synchronization. Prophet’s Customer Relationship Management software is deeply integrated with Microsoft Outlook. It has all the required features for a good CRM software such as Sales Opportunity Management, Sales Reports, Marketing automation, Instant updates, Quote Generation and more. There are 4 versions to choose from; Standard, Team, Enterprise and Dynamics. A 30 day Free trial is available on the website. Here’s a short video by Prophet listing 10 reasons why you should use Prophet CRM software. Sage CRM is developed by the UK based Sage Group, which is the world’s Third largest ERP software supplier, only behind SAP and Oracle. Sage CRM is available in 3 tiers; Sage CRM On-Premise, Sage CRM Essentials and Sage CRM Professional, both of which are cloud based. It has all the key features you would come to expect. And there is a Free trial. SuiteCRM is an Open Source alternative to the paid CRM softwares. To be specific, it is infact the free and open source alternative to the Professional Edition of SugarCRM. There are many benefits of having an Open source CRM. SuiteCRM not only allows you modify it, but also helps customize it for you, train you for it and even host it for you. Its great for small and mid size enterprises who do not have much money to spend at the start. It comprises of the features like Contracts, PDF Templates, Workflow, Reporting, Search, Events, Invoices, etc. Below is a book on CRM, a highly rated book praised by the likes of Kevin Bubeck (Coca-Cola) and Gareth Herschel (Gartner Research). The idea was provide you with a brief overview of the list of companies who provide the Customer Relationship Management software. Depending on your industry, company profile, budget, employee strength, Client strength and other such factors, you should be able to have a fairly good idea about shortlisting and eventually selecting most suitable CRM software help your organization grow and work more efficiently to provide better results and better customer satisfaction. If we missed some company, feel free to pour in suggestions. Useful blog post! This blog helps my friend to select interested CRM software from the list of 20 companies. I’m proud to send this blog to my friend. Really your article is very useful to me. Customer Relationship Management software is mainly focused on small businesses. Wonderful blog post! The list of 20 CRM software is intended mainly to boost small business, thus increasing the productivity and the revenue of the company.